Jan commented about the quantity of John Deere fabrics in my stash: there are actually only 2 John Deere prints in this particular quilt. One is the yellow with tractors on it, the other is a green print with black tractors. The actual color scheme for this quilt came from one of the stripes that I used — I didn’t really want to make an all green/yellow quilt. When I put the stripe that has yellow/blue/green/turquoise with the John Deere prints, I knew what to look for for coordinates. I’m planning on some more black for a border, and beyond that, I’m not sure. I do have yardage of the yellow print, but a little bit of yellow goes a very long way……..I’ll probably use that for the back……. Over the years, I’ve had other Deere print fabrics as well — we have a few pillows around (pillow panels…). I also had a plaid (blues and blacks) that had the Deere logo on it, that was used to make my father-in-law a quilt. That quilt has a blue flannel on the back that has a bunch of John Deere logo caps on it. I also bought some fabric that has the words “Nothing runs like a Deere” repeated over the whole thing, but the weird thing is this: the yellow background is a completely different yellow from the other fabrics in the line, so it doesn’t go with anything……..
Why so much John Deere logo fabric? Have I mentioned that my in-laws farm? And that my DH works as an engineer for Deere? Well, now that I’ve gotten most of the piecing of that quilt out of my system, I’d better go get back to work sorting and folding and organizing. I’m making progress, even though it really all looks worse than when I started…. Hmmm Pink paisley John Deere fabric – who knew! The quilt is really cute! Are you going to quilt it with meandered tractor wheels? Hi there! Loving your blog! I am not familiar with the disappearing 9 patch…is it a pattern or are you able to tell me how you did it. I would love to know…keep on blogging and sewing…I learn so much! Thanks so much! I’ll forgive you for buying the end of the bolt of the pink and green paisley a few weeks ago if I can have a scrap (say at least 6″ square) of Deere pink paisley. Pretty please! Can’t wait to see Gage’s quilt in person. This is marvelous. I confess that I was concerned when you whipped out the John Deere fabric, but look how wonderfully it turned out! It has a very soothing, abstract feel to it. Love that quilt — and the John Deere fabrics! What fun. I had a boyfriend in PA who loved all things John Deere. Decorated his whole house with it. You have finally made me LIKE something John Deere and find beauty in it! Great job! I love the quilt and how it turned out! I love the nine patch too! Your blog is fantastic. I am going to follow you hope you don’t mind another admirerer!!!! Now now …. from what I understand, it’s the HAT that costs the money, and the John Deere equipment that comes “free” with the purchase of the hat. 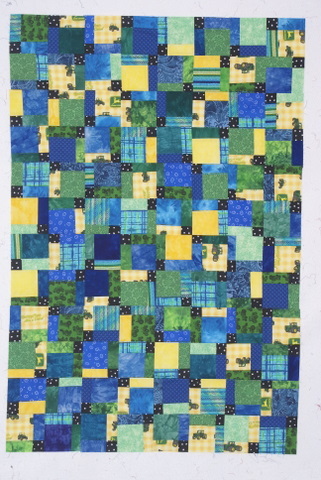 I’m working on a JD quilt for her (SIL) and her husband using JD fabrics. [Their kitchen cupboards are JD green … if you can imagine].